Please take note we are open TWO Days per week. Also Easter and August Bank Holiday Mondays only. Please phone to make a booking if you'd like to visit outside these hours. 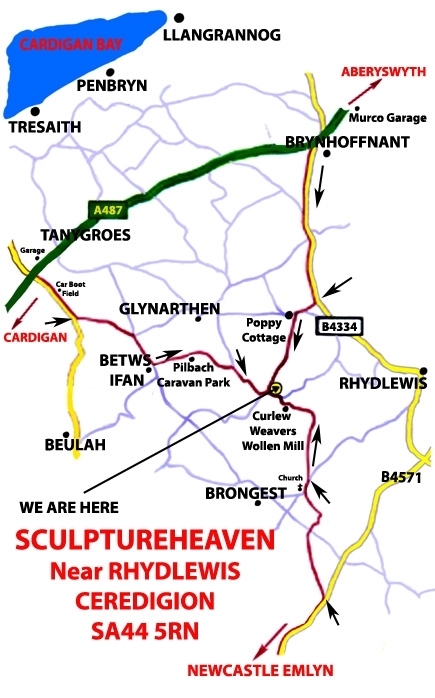 Sculptureheaven is in the beautiful Ceri Valley just a few miles from the Cardigan Bay Coast. It is best to use SATNAV to find us (SA445RN) as roads in our area have no names and can be confusing. We are roughly in the centre of the triangle made by Poppy Cottage, Pilbach Caravan Park and Curlew Weavers Woollen Mills (also open to visitors). You can always ring us for directions if you get lost, however mobile reception in this area can be sporadic, so it may be a good idea to print the map out to help you find us.